While truly wireless earbuds are obviously where personal audio is headed, they still require listeners to compromise on battery life, sound quality, wireless reliability, and price. That’s why there's neckbuds. While the 65t are slightly cheaper than the 65e, they lack active noise cancellation, a shorter battery life, and a less reliable wireless connection. That said, commuters may enjoy using true wireless earbuds for short periods of time but they don’t do well for travel. For those folks or for listeners who want the additional specs and features, the Jabra Elite 65e can scratch that itch. The Jabra Elite 65e are very well built with plastic, metal and rubber construction. The headphone is made mostly of plastic and rubber to resist sweat, making them decent gym mates. Also working to its advantage is the fact that the Elite 65e are extremely comfortable during extended listening periods thanks to a majority of the weight resting around the beefy neckband. While not flexible for compact storage like the OnePlus Bullets Wireless, the Jabra 65e’s neckband gives the headphone a solid feel that you won’t have to worry about tossing in your bag. Even better, Jabra includes a nice zippered neoprene case to protect the headphones in transit. The earbuds themselves are quite large, thanks to the required microphones for active noise cancellation. This means some users may not like the fit as the buds are quite large and, unfortunately, there are only 3 pairs of tips to choose from. The medium size worked the best during our time with the headphones, but we felt they were a bit too small for our ears while the large tips were simply too big. Stuck between two sizes that didn't quite fit, we wished Jabra included more tip sizes to help listeners find a fit that works for them. The earbuds are connected to the neckband via a flat cable, which helps resist tangling and cable noise. To further prevent tangling, the earbuds also snap together magnetically similar to the Apple BeatsX. Jabra includes 3 sets of wings as well to help keep the earbuds from falling out during exercise, which are rather comfortable and ultimately great at holding the earbuds in place. Charging is achieved via a micro USB port on the neckband the and headphone playback controls are located on the right side of the neckband. The left side of the neckband features buttons to toggle ANC and a long-press will activate the “HearThrough” feature, which lets you hear your surroundings without removing your earbuds. There’s also a dedicated voice assistant button for quick triggering. iPhone users will get Siri while Android users can choose between Google Assistant or Alexa - though Amazon's assistant won't be available until later this year. Since the headline feature of the Jabra Elite 65e is its active noise cancellation, let’s talk about that first. Compared to industry leaders like Bose and Sony, the Jabra’s ANC is simply mediocre. It did a good job of filtering out low frequency sounds but couldn’t cope with higher frequencies like voices and the screech of a rolling train. Combined with the limited selection of eartips and the combined passive and active noise cancellation is simply average. In terms of sound, the Jabra Elite 65e is balanced and punchy. Bass has a nice body but doesn’t extend enough into the sub-bass region for electronic music. We found the bass to sound a bit uncontrolled at times with very bass-heavy songs. Mids are somewhat drowned out by the bass-forward sound at times and the highs lack sparkle. With noise cancellation off, the bass sounds slightly even less controlled so leave ANC on. Overall, the sound is a bit soft but these are not audiophile earbuds. You’ll have to spend a lot more for the Sony WI-1000X if you want audiophile sound. In terms of battery life, expect to get around 8 hours of playback with ANC on. You can stretch the battery to 13 hours if you use them with ANC off, but we doubt many users will be using the Jabra Elite 65e without its headlining feature. In the real world, we found Jabra’s battery life estimates spot on at medium volume. The $200 (£180, AU$350) Jabra Elite 65e offer solid build quality, mainstream sound and decent comfort for appropriately sized ears. 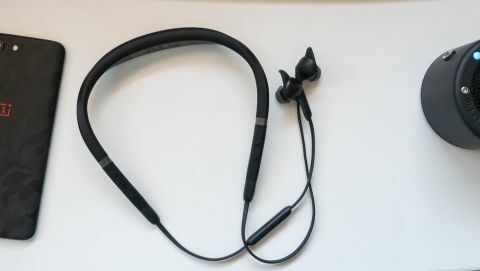 That said, they're up against some serious competition in the neckbud segment and its shortcomings - like its bass-heavy sound, mediocre ANC and limited tip selection - prevent it from being one of the best available on the market. If you don’t need active noise cancellation, the OnePlus Bullets Wireless are tough to beat for $70 (£70, about AU$124). For those with more money to spend, the Sony WI-1000X and Bose QuietControl 30 offer better sound and ANC (the Sony sounds better than the Bose). And for those who value the convenience of truly wireless earbuds, its Elite 65t sibling can be had for slightly less money while offering similar noise isolation with a better fit. But if you’re a frequent traveler who values comfort and active noise cancellation, the Jabra Elite 65e are a solid choice.